First known picture of Derek and Ric at Christmas. As featured in this week’s podcast, our highly curated list of gifts for the Fanpeople in your life. Of course you can also use it as a shopping list for yourself, right? You’ve been very good this year! Kohls for T-shirts and Hawaiian shirts – and plenty of fanboy-centric Holiday Sweaters! You may even be able to find a Kohls coupon to make your shopping a little bit cheaper! Through your local comics shop, give a subscription to a comic that you can hand deliver all year! Give a gift subscription to Marvel Comics Unlimited! Or Comixology Unlimited! Netflix / Netflix DVD Gift Cards (scroll to the bottom of their main page) – They get a free month plus whatever the value of the card if they haven’t already used the free trial. eBooks and eComics make great last minute gifts if you know your friend owns a Kindle/iPad/ etc… Be sure to check the feedback when you’re shopping on amazon because some companies remove feedback on Amazon. It’s pretty easy to tell if they’re genuine reviews so make sure you do your research before buying a gift for someone. 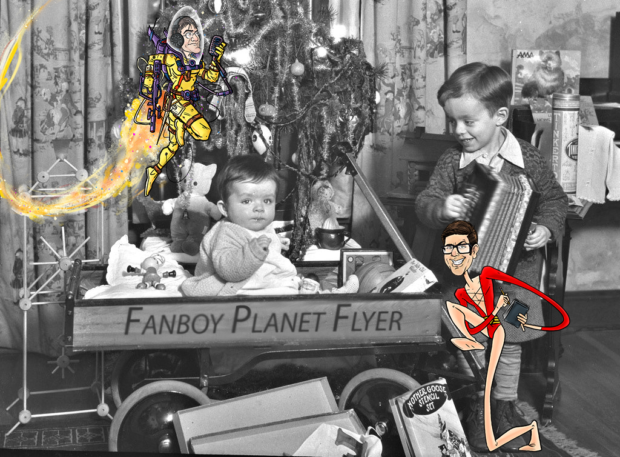 Whatever you do, whichever you celebrate, have a Happy Holiday and thank you for being a fandroid of Fanboy Planet!